The workshop "Al-mashaa' or the Space of the Common" takes up an urgent current topic to be examined in the spirit of Edward W. Said: It aims to reflect on public and common space in regard to, as well as beyond the events and places of the Arab revolts. These revolts have been fundamentally challenging the repressive and conservative face of public space in different Arab countries and have enabled re-articulations of common space. However, the ambiguous nature of contemporary public space could be also observed in the context of the recent protest movements in Western societies. And finally, the categories of public and private need to be reconsidered in places such as refugee camps, given the fact that no legal recognition or the right to private property exists here. Against this background, the purpose of the workshop is to explore ways in which public and common spaces are shaped and constituted. Curators Sandi Hilal and Alessandro Petti propose a critical understanding of the contemporary notion of the public by re-imagining the notion of the common. The demand for active participation is a fundamental aspect of the common and is also present in the Arabic term mashaa', referring to shared land, whose possession was recognized through practice: Mashaa' could only exist when people cultivated land together. Thus, it appears to be crucial for this category to be activated in common use. How to engage with the "space of the common" or "al-mashaa'" today? 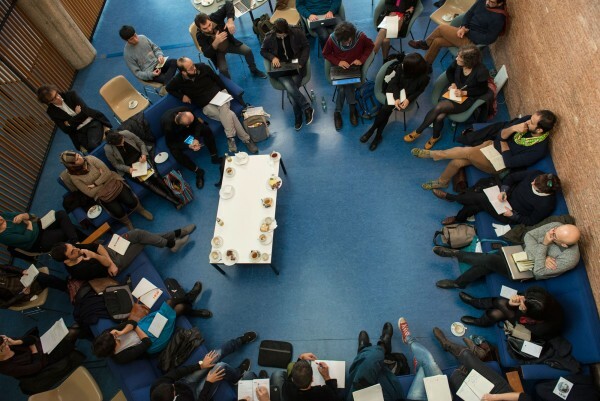 International participants of the workshop, mainly from the Arab region, and German participants have been identified via an open Call for Participation in collaboration with the Goethe-Institut. Sandi Hilal is an architect based in Bethlehem. She is consultant with the UNRWA on the camp improvement program, a founding member of DAAR as well as of the initiative “Campus in Camps”. She is co-author of several research projects, such as “Stateless Nation” “Border Devices”. Alessandro Petti is an architect and researcher in urbanism, based in Bethlehem. He is director of the experimental educational program “Campus in Camps” and of DAAR, an art and architecture collective and residency program which combines discourse, spatial intervention, education, and legal challenges. Qussay Abu Aker, participant of Campus in Camps Project, Bethlehem. Hanna AlTaher, M.A. student in Political Science at FU Berlin and spoken word artist, Amman/Berlin. Ayat al Turshan, participant of Campus in Camps Project, Bethlehem. Yazid Anani, artist and assistant professor of Architecture, Urban Planning and Landscape, Birzeit University (Palestine). Hisham Ashkar, architect, urban planner and PhD candidate in Urban Planning at HafenCity Universität Hamburg, currently based in Berlin. Mansour Aziz, artist and researcher, Beirut. Gautam Bhan, sociologist and urban planner, Indian Institute for Human Settlements, New Delhi. Musquiqui Chihying, visual artist from Taipei/Taiwan, M.A. student at Universität der Künste Berlin. Kegham Djeghalian, visual artist, lecturer, art director, and fashion editor, Egypt/Palestine, based in Paris. Ilana Feldman, Professor of Anthropology and International Affairs, George Washington University, Washington DC. Elena Isayev, senior lecturer in Ancient History, University of Exeter. Nedaa Hamouz, participant of Campus in Camps Project, Bethlehem. Iyad Issa, architect, artist, researcher, Riwaq Centre for Architectural Conservation, Ramallah. Yelta Köm, architect, independent writer, M.A. Student at Staedelschule Architecture Class, Frankfurt/ Germany, NGO “Herkes İçin Mimarlık”, Istanbul. Vasif Kortun, Research and Programs director of SALT, in Istanbul and Ankara. Thameur Mekki, journalist and music manager, Tunis. Omar Nagati architect, urban planner, designer, and co-founder of CLUSTER, Cairo. Sahar Qawasmi, architect, Riwaq Centre for Architectural Conservation, Ramallah. Dina Ramadan, assistant professor for Arabic and Director of Middle Eastern Studies at Bard College, NY, currently fellow at the Forum for Transregional Studies EUME, Berlin. Felicity Scott, professor for architecture at Columbia University, New York. Urok Shirhan, artist, M.A. studies of Global Arts at Goldsmiths’ University, London. Pelin Tan, sociologist, currently associated professor and vice-dean of the Architecture-Faculty at Mardin Artuklu University (Turkey). Hanan Toukan, sociologist, SOAS, University of London. Toleen Touq, cultural producer and manager, curator, Amman. Bettina Vismann, architect and artist, teaches the Master’s program “Space Strategies” at the Art Academy, Berlin Weißensee.